We wanted to share with you Lean Methodology ideas our developer Adam Love has been helping us at Square 205 implement in various ways across our application development processes. These are a collection of experiences and experiments to highlight the insights he has gained from Lean. In my experience creating apps, there have been features I’ve made that I’ve fallen in love with, but somehow doesn’t gain traction, so people don’t understand my love affair. It sticks out like a bastion of bloat that never gets more design, development or UX/UI attention, yet remains a passenger on a fast changing app. A design team can make a great design and developer can create a bug-free code base, but that still doesn’t ensure a specific feature is going to end up in the loving arms of the end user. Chances are that the perfect feature didn’t solve a dire enough need. From my experience, a common feature that tends to have waste is a messaging system. Messaging systems are so easy to tack on extra features such as file attachment, image upload, embedded links, read and unread status and the list goes on. What are the right amount of features to have? Would people use this messaging system over alternatives like Facebook, Slack or email? I think a lot of people tend to jump on the most robust features for the dollar and that is when we get stuck in making products that might not fix any problems. Waste is unavoidable, in fact, most successful apps pivot from their original idea into something different. That’s why Lean thinking states that it’s important to continually test if our products are effectively fixing the most needy problems to avoid heaping on large amounts of features that could be waste. Perhaps the biggest insight I have gained from Lean is that people tend to focus unproportionally on their solution rather than figuring out the problems they are trying to solve. In fact, Lean thinking puts twice the emphasis on problems than solutions. 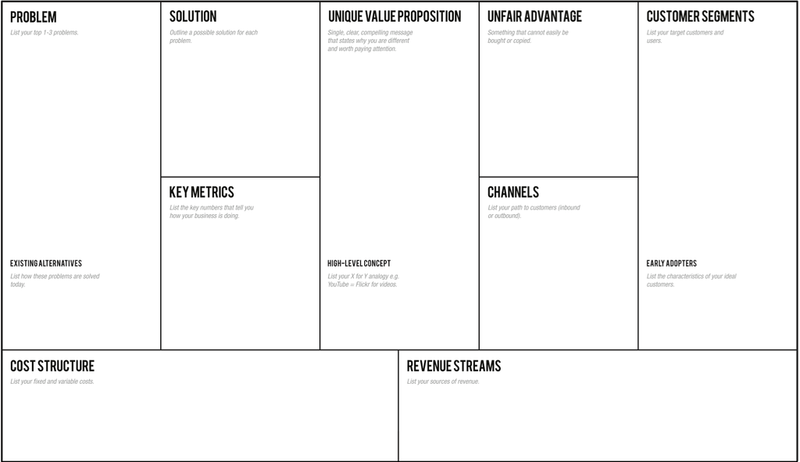 Notice how much real estate the solutions and problems boxes take up on the whole canvas. What effects does this problem have? Where does this problem exist? When does this problem occur? Why should the problem be fixed? Metrics are a way to figure out which problems to start on, or how well our users like our feature. A simple metric to start with is lining up some problems we want to solve and asking people on a scale of 1 – 10 how much they face the problem in their daily life. Another test we can do is a / b testing, we have one version of the app with the feature and another version of the app without the feature and then see which one out of our two user groups is happiest with our product. Tests like this give us quantitative data that we can easily measure to guide us through the development of the app. However, for best results, Steve Blank coined the phrase GOTB, which means “get out of the building,” to actually get out in the real world and meet your would-be users. I did a little Lean experiment last year. It started when I was brainstorming ideas on how to help the local music community. From Lean thinking, I wanted to put more emphasis on figuring out the problems than offering solutions. I made an app that gave the ability to post problems and then vote on the problems with a simple upvote and downvote system. Before any votes were cast, I had in my mind that the local community needed a place to show their music. However, when the results came in, the top problem turned out to be that musicians needed a place to practice music. A simple voting app was able to prove my initial hunch wrong, as well as give me other valuable insights about the people I wanted to help. Just a small amount of Lean thinking was effective. What’s the right scope to release a minimum viable product (MVP)? Most people who want to start an app come to the plate with Waterfall type thinking, meaning the app will be planned out in full on day one, that then would be handed to your favorite app developers, they’d build it and then release to market. A vast majority of apps that are successful unfortunately didn’t reach that success with their original idea, and with waterfall, you could release a fully functioning app that might not fit the market. With iterations, we can continuously release new features after the MVP so our barren app won’t stay that way. Lean says that an MVP is the smallest bit that we can begin writing up tests and measurements to see how effective our solution is we are testing in the MVP. As a boutique agency, we can engage in closer collaboration with our clients usually allowing them to control the helm as the product owner. Product owners figure out the value of each feature that we are wanting to make using metrics like a / b testing or user surveys. We, as an agency, will match those values with the cost of implementing the features and as a whole, we can target the most valuable features with the lowest cost to implement. Studying Lean changed my whole perspective on developing products, with the most impactful concept for me being a focus on solving actual problems instead of creating solutions to unvalidated potential problems. Initially, it was challenging to integrate Lean processes into my workflow but given some time, the benefits to the products I build and my workflows have been great. I might not be right in my assumptions the first time when I make a product but Lean gives me a way to iterate towards solving problems with the most effective solutions at the lowest overall cost. Streamlining development and creating effective solutions are both keys to not only successful app development, but also successful digital marketing campaigns. At Square 205, we craft effective and unique marketing solutions for your business. Contact us today to discuss how we can creatively solve your marketing problems.